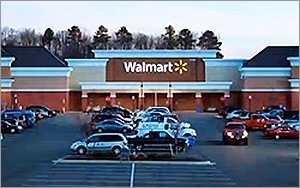 It comes as no surprise that Walmart enjoyed the most foot traffic of any retailer in the U.S. in October. But did you know that Walmart shoppers are also most likely to favor Sonic Drive-Ins and the whitepages, while Starbucks visitors tend more toward Jamba Juice and the Uber app? Okay, well, maybe not that counterintuitive. But these are some of the interesting insights about foot traffic that location analytics company Placed is making available to the general marketing community this morning. The Placed 100 will be a monthly ranking of the most-visited businesses in the U.S., cutting across retail, food, convenience stores and other major categories. The data comes from Placed’s long-running opt-in panel of mobile users who have agreed to have an app that measures their location data. According to CEP David Shim, the panel has now topped 500,000 participants. “On average, Placed measures 1,000 latitude and longitudes per panelist per day,” he tells me. The data is normalized to be demographically representative. The data is part of its Placed Insights product subscribed to by many of the top retailers and the major ad agency holding companies, he says. The Placed 100 is a public version of some of the data. The result is a kind of Nielsen rankings for foot traffic. The top ten include the usual suspects: Walmart, McDonald's, Subway, Starbucks, Walgreens, Target, CVS, Burger King, Taco Bell and Wendy’s, in that order. Beneath that top ten, one begins to see month-to-month movement in the rankings. KFC (#35) leaped six spots since last month, while cooler weather had a predictable impact on Dairy Queen, moving down four ranks to #35. Kmart was up substantially in October, perhaps reflecting the October rush for treats and costumes (from #56 to #45). Party City got the best Halloween bump, up 23 spots to #97. At least as interesting is drilling into the individual retailers and seeing what the affinities of each retailer’s shoppers are for other business categories, businesses and iOS and Android apps. Who knew that Chipotle visitors using Android also tended to sport the Target Cartwheel app, or that Android owners going to Goodwill have a very strong attraction to casino games? This is just another indication of how mobility is adding a layer of new data to our understanding of consumers -- not only where they go, but in what combination with other behaviors. 1 comment about "A People Meter For Retail Foot Traffic Launches". Jeremy Geiger from Retailigence, November 23, 2014 at 5:07 p.m. This is great stuff. Let's hope retailers take advantage of these new data streams for insight, learning & adaptation for competitive advantage. The analogy for CPG and brand manufacturers is measuring shopper's mobile-to-store path-to-purchase action & in-store sales lift, both a SKU level, which I'm seeing innovators now do regularly, not just as a "test."